The Giant’s Causeway is some of the most unique and beautiful coastline in the world. There are few things as beautiful as the coastline in Ireland and Northern Ireland. The big waves and rocky shores create some exquisite scenery. The coastlines are one of the many things that we absolutely love about Ireland. Mother Nature’s finest work is so beautiful that it is hard to put into words. Even pictures don’t seem to do these places justice when you look back at them. These are places you have to see in person to truly appreciate. All of this is especially true of the Giant’s Causeway in Northern Ireland. It is some of the most unique and beautiful coastline in the world, and one of our favorite places in Ireland and Northern Ireland. Over 40,000 unique basalt columns, created by an ancient volcano, extend from the ground like a giant jigsaw puzzle. It is an amazing sight to behold. The tops of the columns form a hexagonal jigsaw puzzle that extends from inland into the sea. The tops of the columns form unique hexagonal stepping stones, the highest of which is almost 39 feet tall, that shoot from the ground. They lock together in a tightly formed pattern that extends from the inland shores to the sea, where they disappear underneath the rolling waves. They are perfect for kids playing “can’t touch the ground” and photographers looking for some beautiful shots with unique and incredible texture. 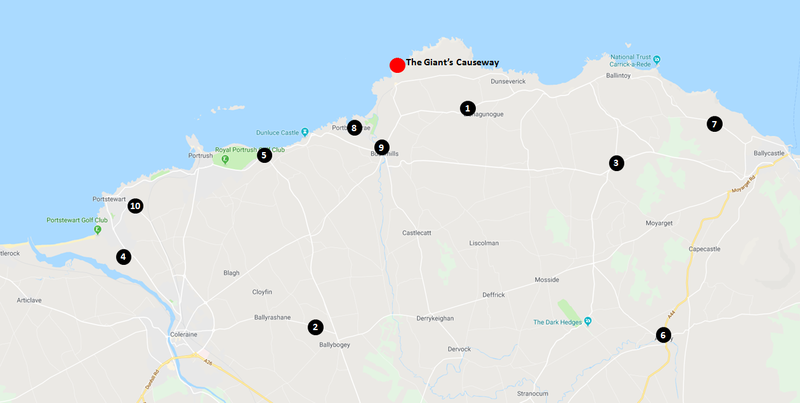 The Giant’s Causeway is in close proximity to the towns of Bushmills (3 miles) and Portrush (8 miles), and is also relatively close to the Carrick-a-Rede Bridge. The Giant’s Causeway is located on the northern coast of Northern Ireland, about 3 miles from the town of Bushmills and about 8 miles from the town of Portrush. It is in very close proximity to the Carrick-a-Rede Bridge, which we highlighted for you in a previous article. If you are going to visit the area, we would definitely recommend visiting both. The Giant’s Causeway in Northern Ireland. 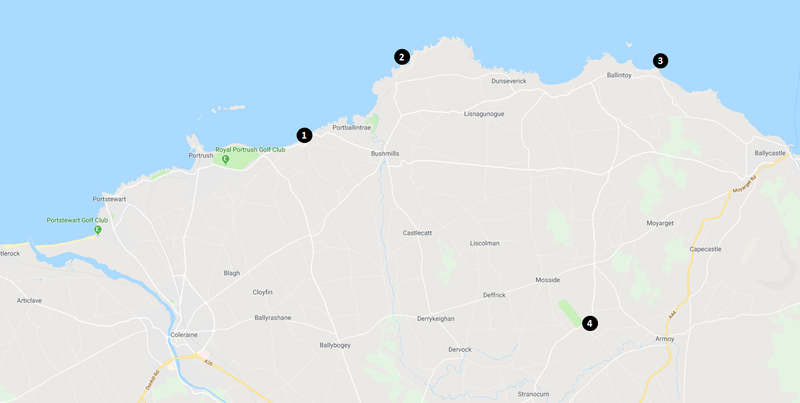 In addition to the Giant’s Causeway, there are a number of other popular tourist attractions in the area that you can see. If you are looking for some additional things to do, I have included a list of additional stops that I recommend below. To give you a better sense of what the Giant’s Causeway is like, we have put together a short video of our visit below. It is such an amazing place that even a video doesn’t do it justice. You have to visit to fully appreciate this natural wonder. Below are some of the pictures that we took at the Giant’s Causeway. Our only regret is not scheduling more time to get some really great sunrise or sunset shots. We would definitely recommend planning your visit around sunrise or sunset if you have the opportunity. Nature is just so clever! Wow! This place is awe inspiring. Would love to visit some day. Thanks for sharing.